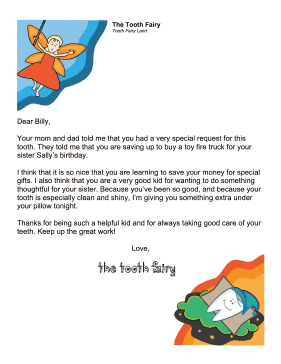 Great for children who are being very good, this tooth fairy letter explains that the child will be receiving an extra reward. Your mom and dad told me that you had a very special request for this tooth. They told me that you are saving up to buy a toy fire truck for your sister Sally's birthday. I think that it is so nice that you are learning to save your money for special gifts. I also think that you are a very good kid for wanting to do something thoughtful for your sister. Because you've been so good, and because your tooth is especially clean and shiny, I'm giving you something extra under your pillow tonight. Thanks for being such a helpful kid and for always taking good care of your teeth. Keep up the great work!